Enhanced Raid Frame: Indicators (formerly Blizzard Raid Frame: Indicators) is a raid frame utility addon for World of Warcraft: Battle for Azeroth that brings configurable indicators for enhancing the built in raid frames, allowing them to function much closer to add-ons such as Grid/Grid2 or VuhDo. 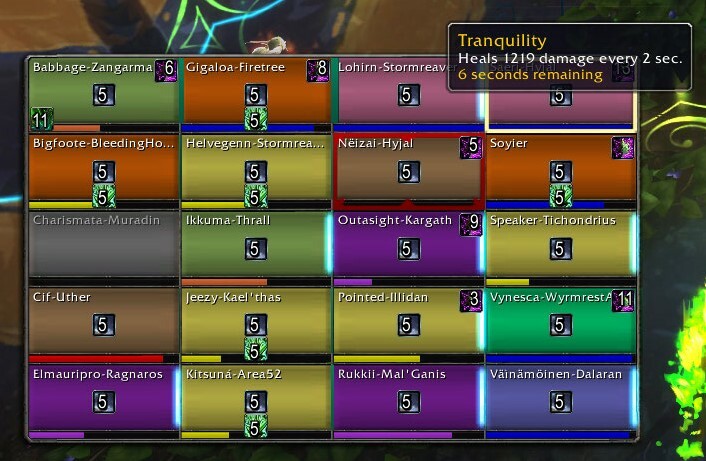 There are 9 indicators for each raid member, forming a 3x3 grid overlaying each unit frame, that allow for showing the presence of and countdown times of buffs and debuffs in any configuration that suits your needs. Indicators can be configured to show any buffs/debuffs of your choice and you can configure several buffs/debuffs in the same indicator. Some simple options lets you select to show only if the buff is missing, only cast by you, stack sizes and more. Example of indicators on a unit. Displayed here are the cooldown frames for Rejuvenation, Germination, Regrowth, Ironbark, Spring Blossoms, Wild Growth, and Lifebloom. Notice how each HoT has a specified location to maximize readability and reflex in combat. This is an example of what you can expect in a raid setting after setting up Enhanced Raid Frame: Indicators. This example is for a restoration druid, but an experience such as this would be common for all healing (and non-healing) classes. Enhanced Raid Frame: Indicators is an extension of the amazing Blizzard Raid Frame: Indicators addon started by Szandos, for World of Warcraft prior to Battle for Azeroth. All credit for the bulk of this addon should go to him accordingly. I, Soyier, take no credit for the idea or implementation of this addon prior to my adoption of the code in the Summer of 2018.
it doesn't work to typing /indicators config also. can't see the option too. oh it all woriking perfect!!! thx to update!!!! Yeah, I don't know why, too. Of course, I have finished organizing the Wtf folder and reinstall. Currently, only the 1.0 version is operational except 1.01 and 1.01a. Great addon thx for all the work. I like to use the "show (standard) Buff icons option" and but want to pick a few of my buffs to be shown elsewhere (e.g. Top-Left). While this works, it's not perfect. The buffs will be shown on 2 placed instead of only the one I wanted. I need an option for the "show Buff Icons" option to ignore those spells/buff I altered to be shown elsewhere. At least I couldn't find any option to solve my issue. Best whishes and thx again for your work & time. Fantastic addon, it makes the default frames usable. I love this addon. I have been able to get all my hots and buffs to show except for Rejuvenation (Germination) I have tried every spelling variation of the buff. Does this not support this? Use the spell ID (155777) and it works fine. Great, this was what I wanted! Is it maybe possible to, instead of using the icon, to use a flat color? I think having all the icons makes it a bit overwhelming. Any chance you could add masque support? Truly, thank you so much for updating this addon. You are the real MVP! Thank you so much for continuing this addon after Szandos!